Grayson and B&B’s Grilled Cheese Hits Saxelby Cheesemongers… Hard. So, I’ve been waiting for this moment for some time now. Seeing as Saxelby Cheesemongers is all of 120 square feet, trying to add one tiny piece of equipment is enough to be the straw that breaks the camel’s back. Lucky for us, we’ve got a stalwart little camel of a cheese shop and have just acquired one new wonderful apparatus. A panini press. 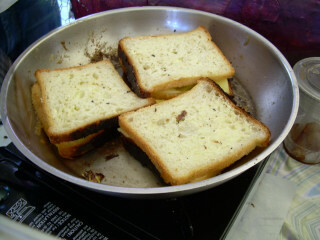 Yeah, I know that paninis are about as new on the scene as sliced bread, but still, the thought of grilling up some Grayson gets me going like we were the first folks to ever make a grilled cheese sandwich. It all starts with Grayson. A pungent, beefy, washed-rind cheese from Meadow Creek Dairy in Virginia. The golden yellow paste and pumpkin-hued rind make it almost too pretty to grill, but then again, what could be prettier than the sight of a well-sated tummy after a good grilled cheese? So, we take our little slices of Grayson (cue in Food Network/Bob Ross style demo voice here…) and we place them ever so gingerly on a sliced Sullivan Street Bakery ciabatta. Now, I must confess… these sandwiches will not look 100 percent like the picture above… d’oh! We’ll be using ciabattas instead of ye old pullman bread, but hey, this picture dates back to our first grilled cheese fest ever, Pickle Day 2006, and I thought it to be an appropriately fetching image. Next, we pluck a few pickled pickles from Rick’s Picks. Their sublime B&B’s to be exact, which are bread and butter slices pickled with dried ginger and dried cherries straight from the northern climes of Michigan. For those of you who don’t know, northern Michigan produces some of the best cherries in the biz, and they are absolutely phenomenal in this pickle mix, adding just a tiny bit of sweetness to offset the gingery kick. Last but not least, we slather the bread with a little (ok, or not so little) butter from the Evans Farmhouse Creamery and it’s time to ready, set, grill! Yikes. The smell of these sandwiches alone is enough to set off the drool reflex. These sammies, though lovely and delicious, will not be on line until Tuesday. So hold your horses just a little bit, and then break into a full out sprint for grilled Grayson and B&B paradiso.